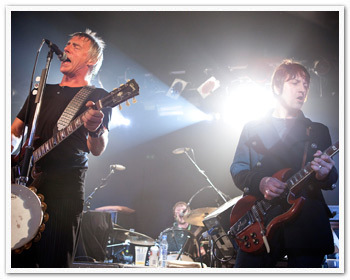 Gem recently joined Paul Weller on stage for the launch of his new album 'Wake Up The Nation' with a storming set at the Relentless Garage in London. Gem took to the guitar during a rousing rendition of The Jam's anthem 'Start! ', while the night was closed with an encore of 'Come On Let's Go' and 'Pieces Of A Dream'. Gem is wearing the Black Peacoat and a 5 button Grandad tee.